You have just got to be wondering why I named these Holy Crap cookies they way I did. 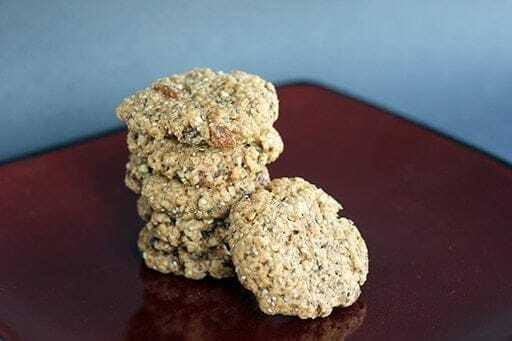 I had mentioned in my Whole Wheat Oatmeal Chocolate Chip Cookie stuffed with hemp hearts (by the way,my kids still don’t know they have hemp hearts in them), that I was going to try a spicy raisin version and kick it up a notch. Of course I try to attempt this the night before an informal parents council get together in the morning to start combing through our volunteer sheets and BBQ RSVP’s and the like. Which meant it was 5 pm, I’m 50 miles away from Planet Organic and I have no hemp hearts – which not to be punny, are the heart of the cookie- so I was searching the south end for hemp hearts. Save On by my house did have the Holy Crap cereal which is renowned for being full of every super food that Mother Nature ever made. 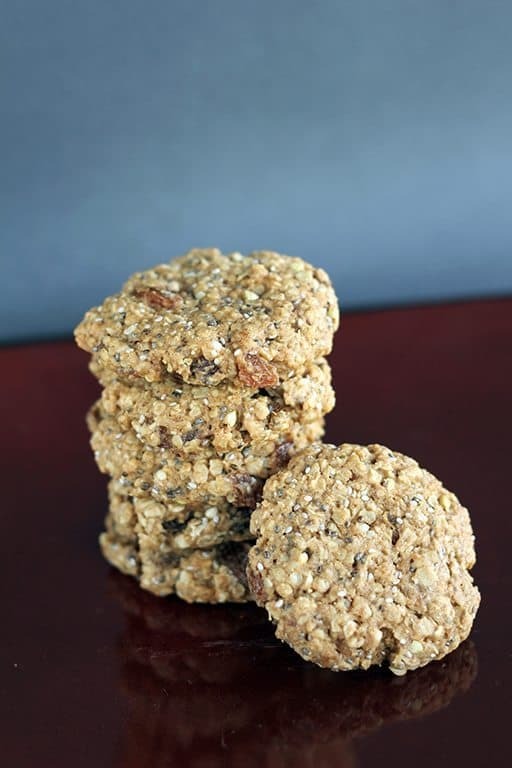 I stood in the aisle reading the ingredients while my feral children wrestled each other and knocked over a Ty stuffed animal bin – not an unusual shopping occurrence by any means- and decided that since they had hemp hearts, I was holding true to the cookies. 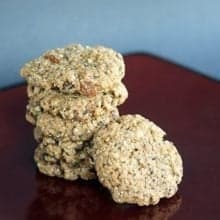 I was a little leery of using the chia seeds, since they can and will go gooey-thus are a natural binder-but mused that they would give me the opportunity to use even more dry ingredients in the cookies. These cookies were a smashing success. Being peanut free, they can be sent to school with your child in their lunch. 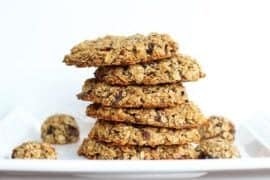 They are whole wheat, use low glycemic index palm sugar, have large flake oats that are filling and healthy and between the Holy crap cereal and raisins, pack a wallop of iron, omegas 3 & 6 and are full of fibre goodness! And a little bit of beautiful, grass-fed organic butter can be darn good for you– as much to the contrary as we are led to believe- and much better than the fake margarines out there. However, if you have allergies, then feel free to try subbing in your chosen butter substitutes, but they should be the hard “brick” type. As we all know, I’m not a “send cookies to school” kinda parent, that this only happens on Friday’s lunches for a special treat. These, however, made the list of “during the week” food. I’ll also tell you something. I allowed these for breakfast one morning as w”ell. 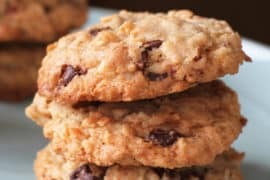 So these – out of ALL the cookies recipes on this site- have the distinction of being the only ones I will tell you to send to school in your child’s lunch. They are a powerhouse of nutrition when you use the right ingredients. Be picky, try to use organic as much as possible for all the ingredients below. Did I mention they taste absolutely phenomenal as well? Cream together the butter and the coconut palm sugar. Once they are combined thoroughly, add in the egg, followed by the vanilla. Sift together the flour,spices and baking soda, then add to the butter mixture until combined. Add in the large flake oats and combine. Now it’s time for the Holy Crap cereal. By adding it last and fast, the chia seeds do not have a chance to go gooey. There’s hardly any time for them to start absorbing any liquid from the cookie. Stir in the 5 tbsp and raisins until mixed through. Roll into golf ball sized balls and place 6 to a cookie sheet. Press them flat with the bottom of a glass, making sure to wet the bottom of the glass with water as the cookies will stick. 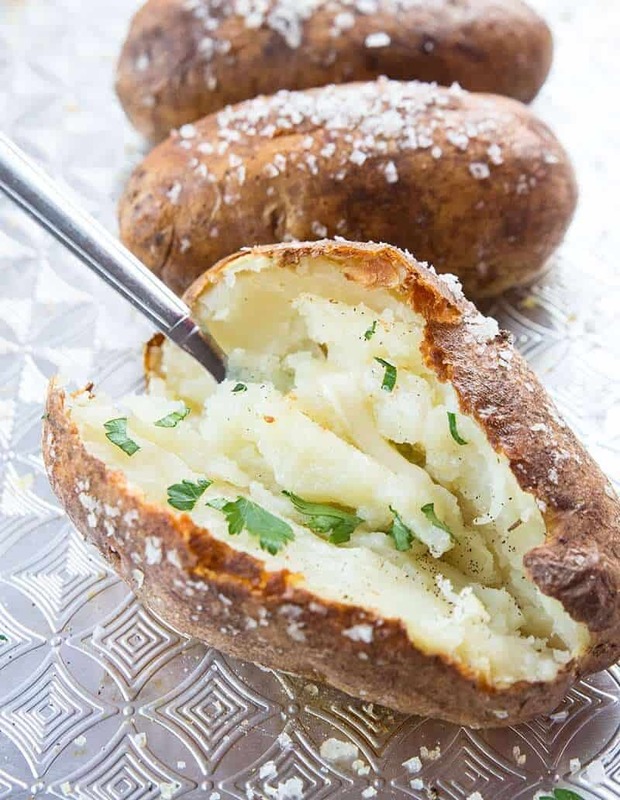 Bake in a 350 degree oven for 8-10 minutes. Remove from the oven and cool on the sheets for 5 minutes, then remove to a rack. This makes a perfect 18 large cookies. Perfectly large, in charge, awesome cookies. I’m off to bake some of these for the kids this very moment, to send in the kids lunch one day this week. That is, if Mike and I can keep our hands off of them long enough to even cool! Did I mention that my kids can’t stop saying Holy Crap cookies as well? They think it’s sooo hilarious. Little devils. 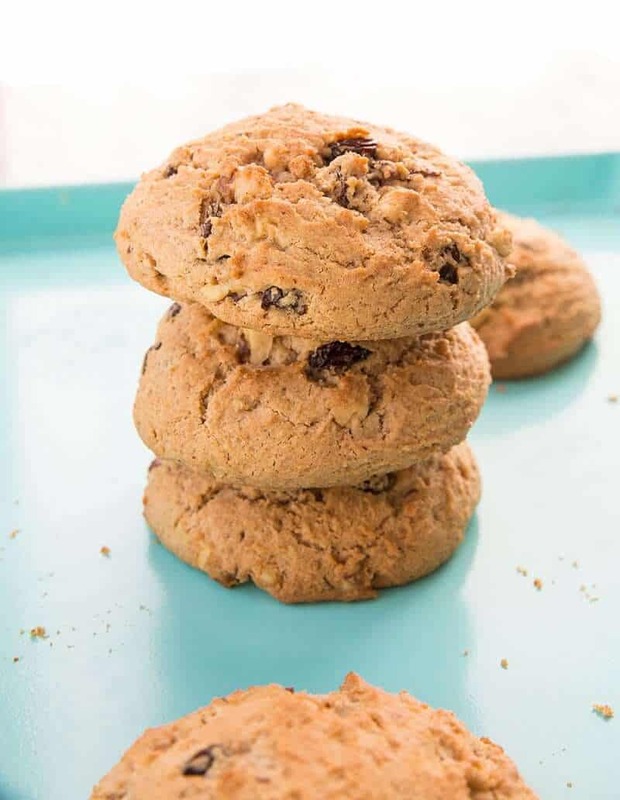 Healthy and delicious cookies made with Holy Crap cereal. Cream together the butter and the coconut palm sugar. Once they are combined thoroughly, add in the egg, followed by the vanilla. Sift together the flour, spices and baking soda, then add to the butter mixture until combined. Now it's time for the Holy Crap cereal. By adding it last and fast, the chia seeds do not have a chance to go gooey. There's hardly any time for them to start absorbing any liquid from the cookie. Stir in the 5 tbsp Holy Crap cereal and raisins until mixed through. Bake in a 350 degree oven for 8-10 minutes. Remove from the oven and cool on the sheets for 5 minutes, then remove to a rack. Hey guys, I'm Karlynn! Welcome to The Kitchen Magpie, my website full of family friendly recipes, cocktails & homesteading tales of chickens & cows from the family farm! Make sure to check out my bestselling cookbook, Flapper Pie & a Blue Prairie Sky ,stay tuned for info on my second cookbook! Never heard of Holy Crap cereal! I thought this was a title that would be out of the mouth of the Magpie herself without any influence from another as creative as she. Brilliant! These look like the perfect Breakfast to me! @HollyKinnamon Do it! They were a hit with the family. Let me know what you think! @KitchenMagpie I will let you know. Healthy cookies are staples in our house. 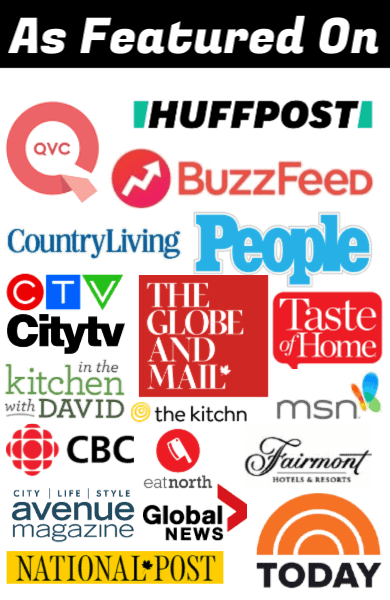 I’m Karlynn Johnston, Welcome to my Blog! 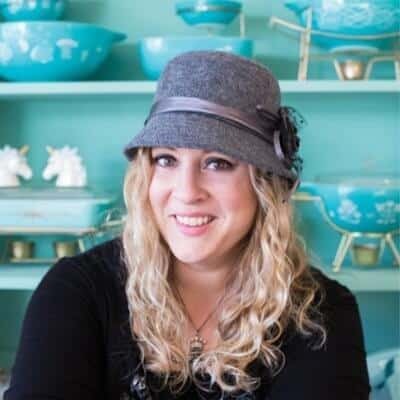 I’m a busy mom of two, wife & cookbook author who loves creating fast, fresh meals for my little family on the Canadian Prairies. Karlynn Facts: I'm allergic to broccoli. I've never met a cocktail that I didn't like. I would rather burn down my house than clean it. Most of all, I love helping YOU get dinner ready because there's nothing more important than connecting with our loved ones around the dinner table!